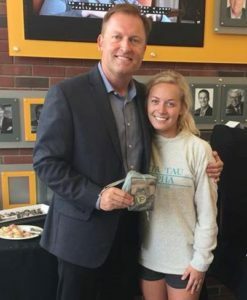 Dave Omholt ’92, has recently spent time on Purdue’s campus as part of the University Residences’ Executive-in-Residence program. Begun in 2014 the program connects students from diverse backgrounds to alumni industry leaders in a more personal way not afforded by a classroom. Based on each executive’s background and connections they spend 4 – 5 days interacting with students in specific academic departments, Residential Life groups, and campus organizations. Dave visited Purdue the week of September 17-21 and met with students and staff in larger group settings and more informally in one-on-one discussions. They also did a taped video interview of Dave which told his career story. These videos, along with the time on campus, are meant to provide students a chance to learn how executives developed their approaches to leadership and forged a pathway from student to success story. 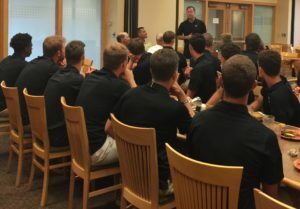 Dave, a former captain of Purdue’s baseball team, speaks to the current team on his Purdue experience. Dave is the CEO and Founder of The Entrepreneur Authority. His company works with aspiring “franchipreneurs” to assist them in selecting a franchise business that matches their interests, business skills and financial goals. In this role, Dave has been one of the first franchise brokers to earn the designation of Certified Franchise Executive (CFE), the highest accreditation in his industry. He has also been quoted on franchising trends in many national publications, including the Wall Street Journal and Financial Times. Additionally, Dave has consulted for hundreds of industries across the US, Canada, and Mexico, including Charles Schwab, Denny’s, Checkers, Great Clips and Potbelly. Dave and his daughter, Gretchen, a sophomore at Purdue, met up on his visit to campus. 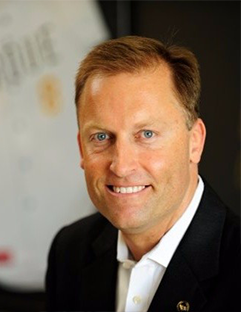 As an undergrad Dave received his BS in Economics from Krannert in 1992, was captain of the Purdue baseball team his senior year, and served as Consul. In 2010 Dave was named to Purdue’s inaugural “40 Under 40” list along with Drew Brees ‘01. Presently, Dave is a member of the Dean’s Advisory Council for the College of Liberal Arts. Dave and his wife, Laura, are the proud parents of three daughters and an English Creme Golden Retriever named Dakota.